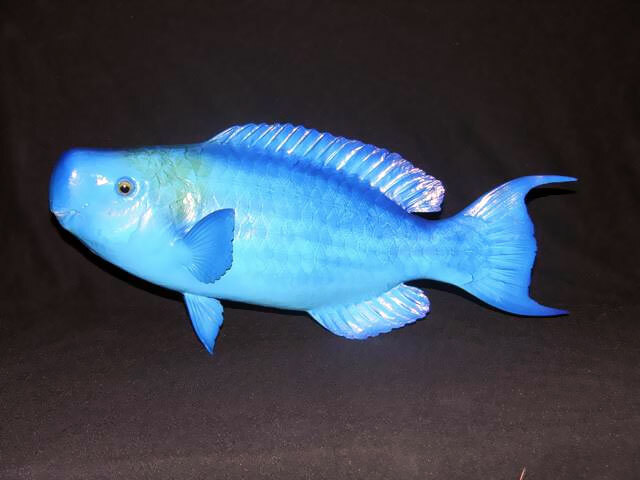 The blue parrotfish (Scarus coeruleus) is a member of the parrotfish genus Scarus. It is found on coral reefs in shallow water in the tropical and subtropical parts of the western Atlantic Ocean and the Caribbean Sea. They are uniformly blue with a yellow spot on their heads that fades as they age. They average 30–75 cm in length with a maximum length of 1.2 m. They develop a large “beak” like other parrotfish that is used for scraping algae and small organisms from rocks. They have pharyngeal teeth that grind ingested rocks into sand. No other species has this uniform blue color as adults.